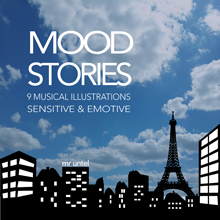 Mood Stories, is an illustration album addressing several themes in the same opus. Atmospheres are diverse and cover both suspense and tension as dream and escape or comedy. A Swiss Army Knife for music and image, it is a hybrid recipe blending synthetic and acoustic instrumentations remarkably mixed by Mr Untel. Ask now for your free promo pack.